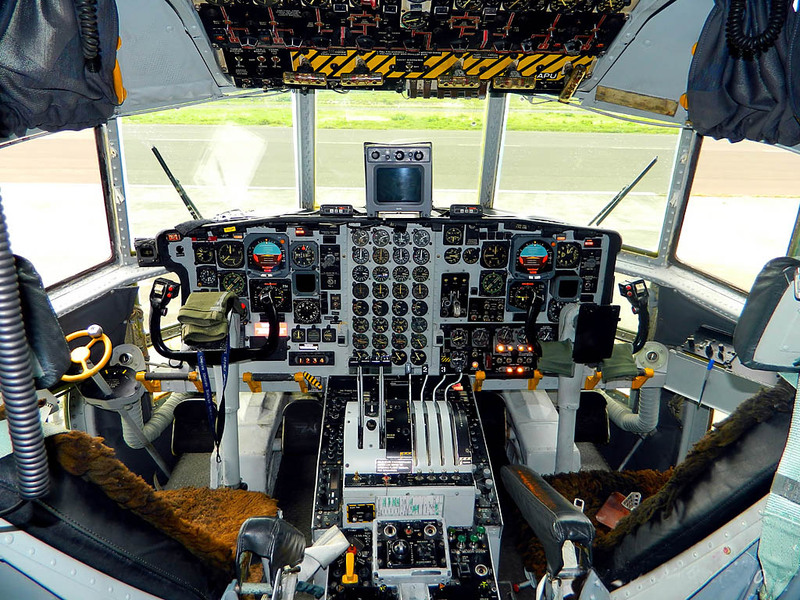 The C-130 Hercules has been – is - a wonderful aircraft.It was conceived as long ago as the Korean War when the US Air Force realised that it needed a serious battlefield transport aircraft. It is said that they drew a circle round a Sheridan tank and said ‘That big’. This is the prototype which first flew on 23 August 1954. That’s more than 60 years ago. Its four Allison 3,750 hp turbo-prop engines could lift a 36,000 lbs load off a dirt strip. Over the years it’s been steadily improved and developed into 70 different variants. More than 2,500 have been produced and operated by 70 different countries.Its versatility seems to be unlimited. The Herc has flown the world over and is the regular supply vehicle for the South Pole station. In the harsh environment, one crashed on take-off and the wreckage was abandoned. Seventeen years later, the Navy decided to take it out of the freezer. It was made flyable and flown out to be refurbished and returned to normal service. The Hercules has gone to war in several guises.It’s been a gunship, studded with the usual 20mm and 40mm guns and also with the rather less usual 105 mm howitzer. Another extreme weapon in its armament is the GBU-43/B ‘Massive Ordnance Air Blast’ bomb (MOAB). This ‘Mother of all bombs’ is too big to be carried by any of the USAF’s conventional bombers. 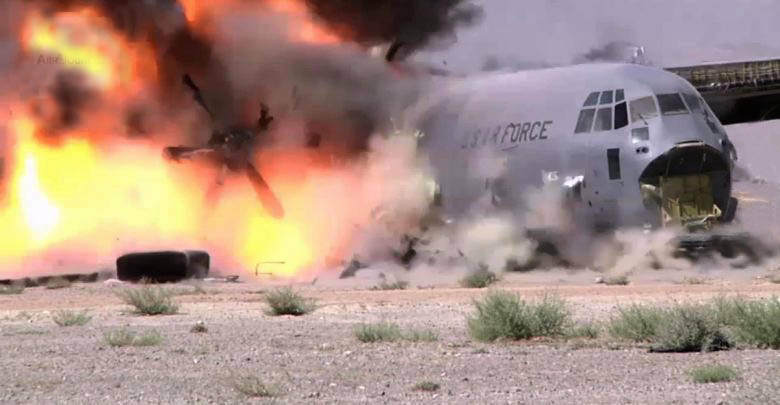 When it was used to winkle Osama bin Laden out of his tunnel hideout in Afghanistan it was a Hercules which launched it by drag parachute out of the loading ramp. Its jet-assisted take off is sufficiently spectacular to warrant its inclusion as a full member of the US Navy’s Blue Angel display team. The drag parachute is useful for delivering loads without landing. Here tests show that work was still needed on robust packaging materials. The tank clearly is expected to be tough enough to need no cushion. Delivering loads to rough strips, possibly under fire, is the Hercules’ day job. To achieve a landing with the maximum load the jets were deflected downwards. Tests went on until they proved that 150,000 lbs was rather too heavy for a safe landing. Covert operations are also in the Hercules’ log book. In 1976 four were used by the Israelis to carry 100 commandos to Entebbe to free the hostages from the hi-jacked Air France airliner. The CIA borrowed a Herc (without markings so that the Air Force didn’t get the blame if anything went wrong) for a 6½ hour low level night flight over China to drop sensor pallets near the Lop Nor nuclear test base. 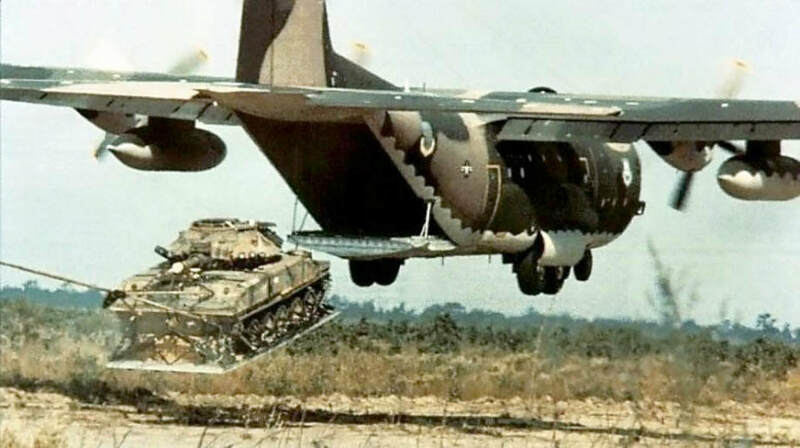 The Hercules has used the Fulton recovery system.Developed by the CIA it enables a person to be snatched from the ground.His harness has a self-inflating helium balloon which holds aloft a cable waiting to be trapped by a low flying aircraft - a Hercules like this. The US Navy took COD (Carrier On-board Delivery) to its limit when they took a Hercules to a carrier. 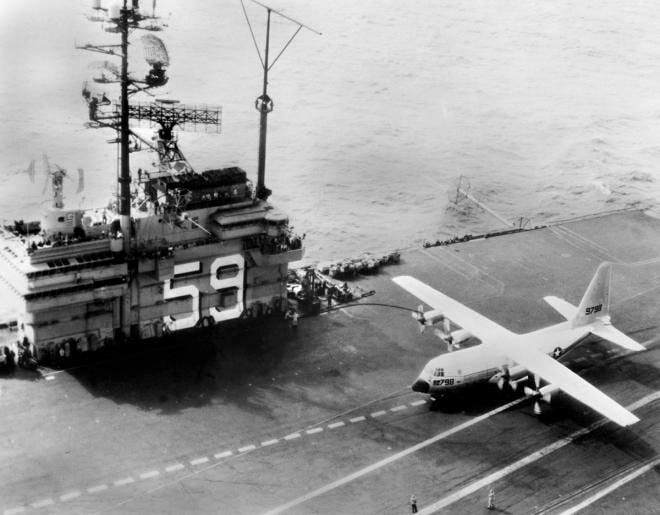 In 1963 the Herc became the largest and heaviest aircraft to land on a carrier. Lt James H Flatley III was awarded the DFC for 29 touch and go, 21 full stop landings and 21 unassisted take-offs on and from the USS Forrestal. Another Herculean achievement must be mentioned.In the Vietnam war, an airbase was about to be taken by advancing Viet Cong troops. The remains of more than 100 aircraft destroyed by mortar bombs littered the base. The last serviceable survivor with a chance of getting away was a Hercules of the South Vietnamese Air Force. It taxied around the debris towards the runway. The loading ramp was still open. A crowd of civilians chased after it, all trying to clamber aboard. Every time the pilot braked the ’passengers’ were pushed towards the nose, leaving more space on the ramp for last minute escapers. Finally, the ramp was raised. The runway was 10,000 ft long and the Hercules used all of that, plus some of the less smooth overrun beyond to get airborne. When they reached safety, no fewer than 452 people got off. A rough calculation estimated that the Hercules was 20,000lbs over its normal operational limit. For this last tale of Hercules use and abuse, we must go back in time and down under to Australia. In 1955 the RAAF was looking for a replacement for its Dakota transports. The short list was the Bristol Beverley, the Fairchild C-123 Provider and the Lockheed C-130A Hercules. 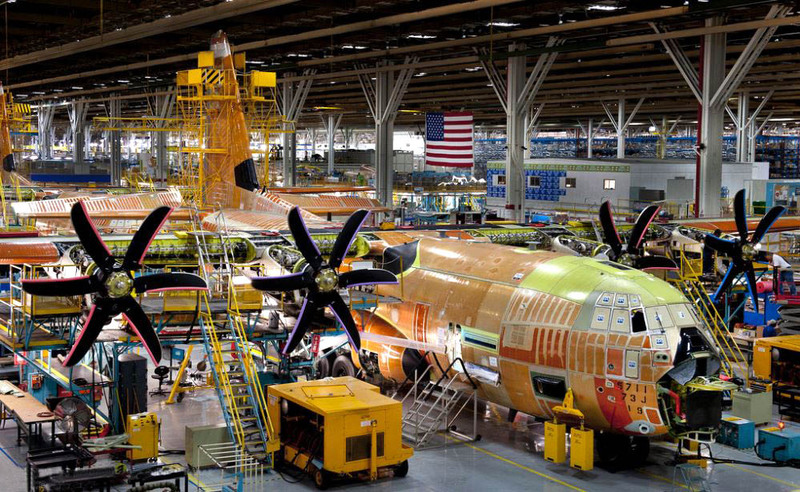 Naturally, the Air Force chose the most expensive – the Hercules. It took two years for the government to swallow the 16 million Australian £ cost but the order for 12 of the last of the A model to be produced was placed. They proved so successful that another 12 Hercs (the H model) were ordered in 1965. It was whilst waiting for the newer models to arrive that a young RAF officer on exchange posting joined 36 Sqn, RAAF.He had previously flown the Hastings and began conversion training to the Herc, first on simulators.Then he went onto flight training. On a bright September day in 1966 A97-207 climbed towards the training area. They were cleared to 15,000 ft but the captain asked his trainee co-pilot to get clearance to 18,000 ft where they duly carried out their planned series of manoeuvres. As an extra, the captain decided to demonstrate the Negative Torque System. The NTS comes into effect in any circumstance where the propeller might drive the engine, e.g. after engine failure. It does this by mechanically slowing the prop. The torque gauge shows what is happening by fluctuating, or bouncing, as the propeller drag varies. 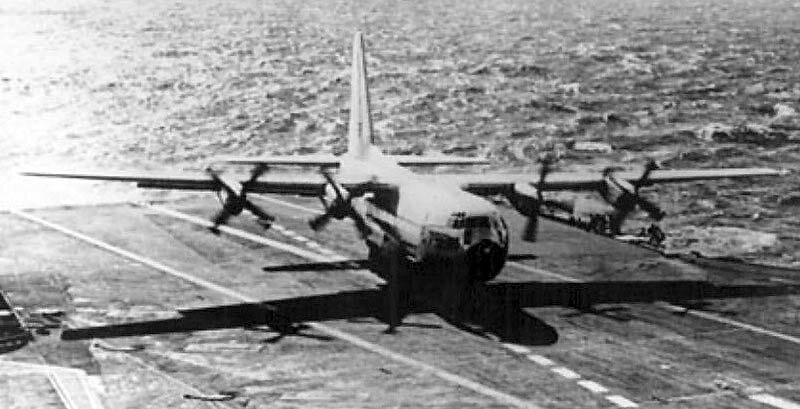 At the same time, the drag on the propeller causes the Hercules to yaw. The Herc slowed toward the stall, power at idle, the nose high with the control yoke hard back and all eyes on the gauges. No. 2 showed the most interesting variations first and the pilots and the flight engineer compared the instruments and discussed the situation. Then, one of them looked up. His explosive expletive caught everyone’s attention. It took a long fraction of a second to realise that although the Hercules was still nose high the little patch of ground that was in sight was at the top of the windscreen.They were upside down. Before they could grasp the implication of their situation the left wing fell away followed by a lurching drop of the nose. Fifty something tons of Hercules tumbled into a spin. Although transport pilots don’t spend much time practising spin recovery, the captain had several years’ experience instructing at basic and advanced flying training schools and was well versed in spins of all variations. He applied recovery action, carefully, and eventually, to everyone’s relief, the plunging Hercules responded. Control was regained in a near vertical dive. No one could remember looking at the air speed indicator. They all stared at the fast approaching ground, conscious that an over-enthusiastic recovery from the dive could over-stress the Hercules, possibly even cause it to ‘clap hands’. (Some years later the wings did break off a fire-fighting Hercules in severe turbulence). At last level flight was regained a mere 1000 ft above the ground. At that point the ground was 2000 ft above their airfield. They had lost 15,000 ft in the spin. The extra climb to 18,000ft had saved their lives. As they crept carefully home to base the loadie, who, strapped in the fourth seat had been a silent observer throughout, asked quietly, ‘Sir, was that a normal manoeuvre?’ Back in his office, the Flight Engineer tried to roll a calming cigarette. He failed, shaking tobacco all over the floor. The investigation team questioned all of the crew individually and as a group, several times. They examined every inch of the Hercules and scanned so much of it so often that it reputedly glowed in the dark. The team’s conclusion, that the event was a ‘spin-like manoeuvre’, was greeted with some derision by the people who had been strapped into in the Hercules throughout the ‘event’. There was a minor beneficial outcome. Before the spin, when A97-207 had approached the stall it had shown a tendency to Dutch roll which couldn’t be trimmed out. After the spin, it flew as straight as a die. Subsequently, flight engineers were instructed to be alert for and to prevent NTS operation on any engine during all training flights. In June 1998, the first of a new model of Hercules, the C-130J came into service. An extensive redesign and updating included the fitting of Rolls-Royce AE 2100 D3 turboprop engines, each producing 4,637 shp and driving 6-bladed Dowty propellers. Compared with the performance of the C-130H the J has 25% more thrust, 15% more fuel efficiency and 40% better range. The digital cockpit and automated flight systems management have dispensed with the Flight Engineer. Eleven variants of the J model are available and they are currently operated by sixteen countries. (The first to place an order after the US was Australia). One curious incident worthy of note was the discovery of sub-standard microchips, initially in some Canadian Hercules. A 14 month investigation unearthed the fact that these chips were originally made by Samsung in the 1990s. A decade later, a batch were recycled, refurbished and re-marked to appear genuine by a company in China. They reappeared in the Hercules and in other US defence equipment. Notwithstanding the dodgy chips, the Super Hercules has so far claimed 54 world records, including a landing by an Indian Air Force C-130J on the world’s highest airstrip, 16,614 ft amsl, in Ladakh Province in the Himalayas. What more could there be to come from the mighty Hercules?